One of the most interesting discussions of the second day and into the third day was a discussion of a proposition by the Sargasso Sea Alliance to make a statement of friendship with the Inter-American Convention for Sea Turtles. Dr. Karen Eckert presented the offer on behalf of the Sargasso Sea Alliance, which hoped to start a dialogue about collaboration in the future. Led by the government of Bermuda, the Sargasso Sea Alliance seeks to protect this ocean of the high seas through awareness and protective measures. 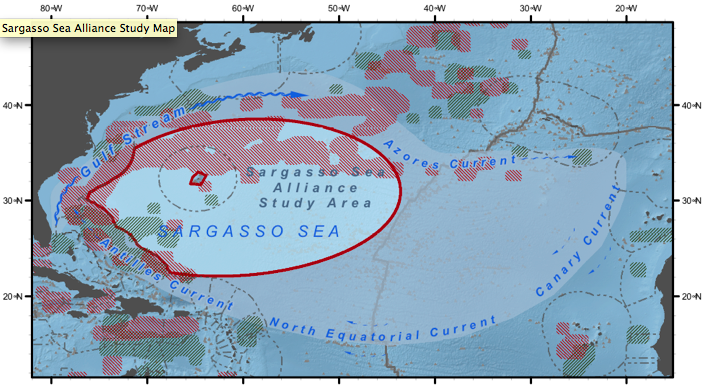 Their effort to mobilize support aims to mitigate the lack of protection the Sargasso Sea suffers because it is considered part of the open ocean or high seas. Named for the floating stretches of Sargassum algae that characterize its waters, the Sargasso Sea is the slowing rotating waters of the North Atlantic Ocean. Known as the “cross-roads of the Atlantic,” the sea encompasses the waters bordered by the Gulf Stream, Antilles Current, and Azores Current. This ocean’s currents gradually move clockwise around a central gyre of deep water in the subtropical zone of the Northern Atlantic. Sargassum is the world’s only completely free-floating and free-living algae and it makes “golden rainforests” in the sea, which contain almost a dozen endemic species specially adapted to the mats of algae; one such species is the Sargassum Fish. The sea covers an area of over 4 million square kilometers and depths of up to 4500 meters on the abyssal plains. The Sargasso Sea is important for providing marine species habitat. This unique sea contains the seamounts and seafloor ridges with deep-water coral and creatures of the mid-Atlantic ridge. Fish species, including many staples of commercial fisheries, use the sea area to breed and find food. These include tuna, marlin, wahoo, and dolphin fish. Other marine animals traverse the sea in migration, including whales, eels, sharks and sailfish. The sea also is critical in the production of global oxygen, despite being conventionally considered oligotrophic. 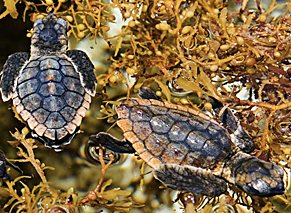 The sea is particularly important for sea turtles. Many endangered species spend their “lost years” growing in the Sargasso Sea. During these so-called “lost years,” juvenile turtles live amongst the weeds, slowly reaching maturity when they can return to the tropics. Over-fishing, pollution, ship traffic, and even Sargassum harvesting currently threaten the sea. These problems continue and are worsening because the majority of the sea lies beyond the jurisdiction of any states. The Sargasso Sea Alliance has begun to gather scientific studies of the sea. These activists are focused on carefully protecting and managing the world’s high seas. Picture Credit: Sargasso Sea Alliance. “A Nursery and Feeding Area.” Sargasso Sea Facts. Pamphlet. The Inter-American Sea Turtle Convention met the offer of friendship enthusiastically, glad to be approached by another international conservation entity interested in the prospect of future cooperation. The Convention devoted time to word-smithing the phraseology of the proposed document, primarily to insure the terms were not legally binding. In the end, the Convention accepted the offer of friendship, and returned the agreement to the Sargasso Sea Alliance for verification of the adjusted wording.